Maybe we’ve been away from Canada for too long this year on our round-the-world travels, but apparently axe-throwing is all the rage now. And what’s a more Canadian way to celebrate my return home, than to sign up for an axe-throwing session iand unleash my inner lumberjack?! 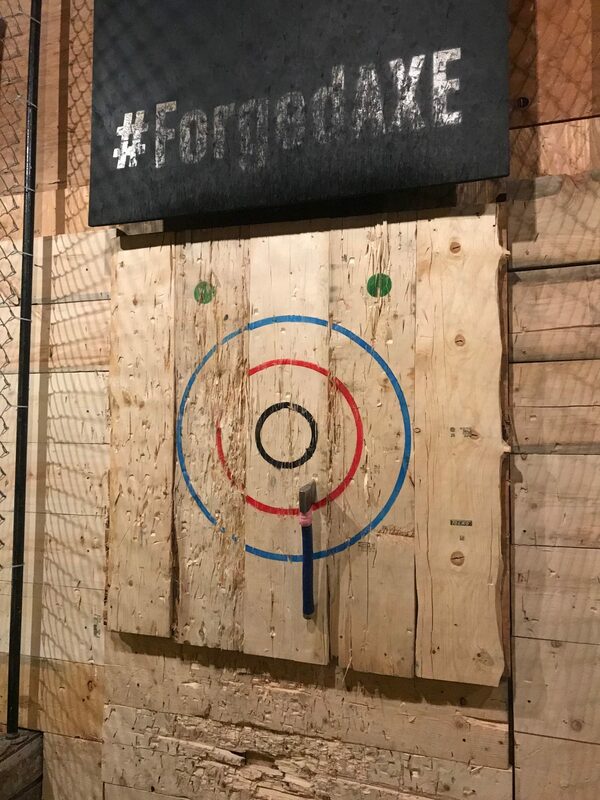 Forged Axe Throwing opened in 2017 in Whistler, BC, and the “sport” (if you can call it that) is exactly how it sounds. You take a big axe, and throw it down an aisle with the objective of hitting a bullseye, rewarded with the satisfying thunk of axes sinking into your target. It’s like archery….but with an axe! 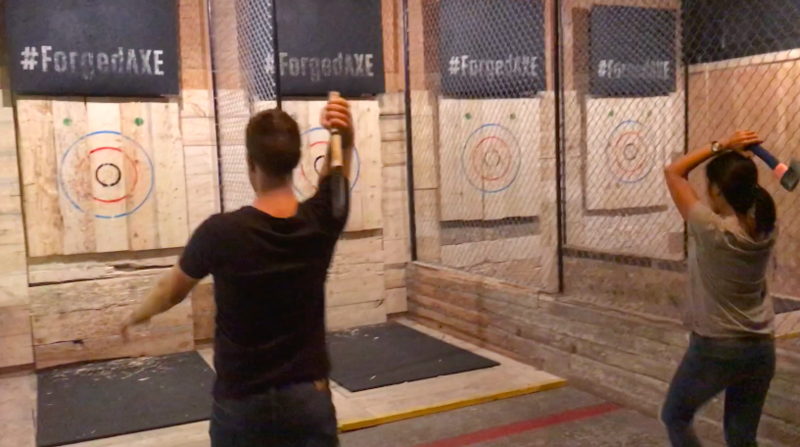 One question I had about this activity before trying it was: is axe-throwing….safe? Every session begins with a quick safety session. In terms of precautions, there are nets on either side of the aisle which (hopefully) blocks any mis-guided axes. All participants must wear closed toed shoes to participate. For better or for worse, the premise isn’t licensed for alcohol — although Coast Mountain Brewery and Whistler Brewing are right next door. And, of course, common sense prevails — wear closed toed shoes, don’t walk into the axe aisle, take your turn while throwing, and so on. We did the hour-long drop in session, which was the perfect amount of time to get the hang of this activity. The axe was heavier than I thought and because the weight of the item isn’t evenly distributed, it takes a bit of practise to throw it. The easiest technique — both from the perspective of a strength and accuracy perspective — is to raise both arms and hold the axe behind your head, then fling forward with aim to hit your target. Using both arms to throw the axe helps you aim straighter compared to using one arm. With just Steve and I playing, it was a good introduction to axe-throwing, but I think the real fun would be to get a group of friends together to check this out. Forged Axe Throwing is located at: 1208 Alpha Lake Rd in Whistler, BC. Drop-in axe throwing is $35/hour. For more information, visit: forgedaxe.ca. Thank you to Forged Axe Throwing for hosting us for a one-hour axe throwing session. 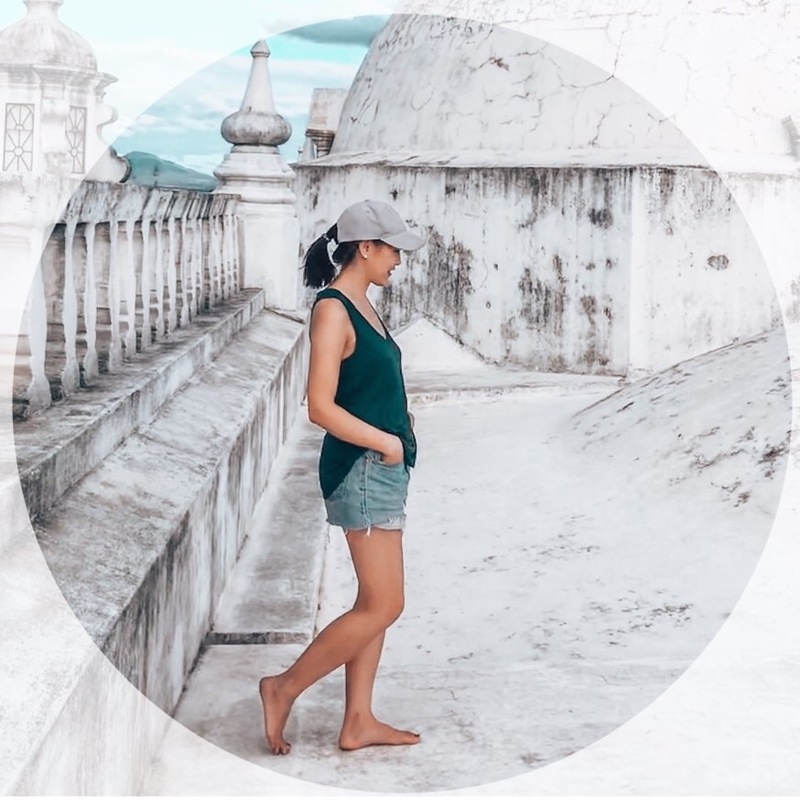 As always, all opinions are our own on Modern Mix Travel.